The central blindingly bright disk fringed with red is the aureole. Two rings surround it. The rings in this corona are slightly off centre because of a gradation in droplets sizes in the cloud. Imaged by Richard Fleet (Glows, Bows & Haloes) in Wiltshire, England during the summer of 2003. Image © Richard Fleet, shown with permission. A corona may be seen when thin clouds partially veil the sun or moon. Look for one around the moon when it is near to full and the sky is dark. 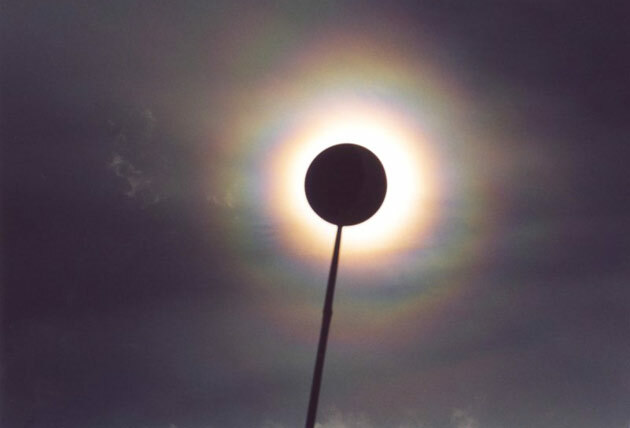 When searching for a solar corona, shield the sun and reduce the light intensity to safer levels by looking at the sky reflected in a pool of water or a mirror of plain glass. Staring directly at or near to the sun can permanently damage eyesight. Tips on eye care. Coronae have an intensely bright central aureole which is almost white and fringed with yellows and reds. Sometimes that is all to be seen but the better coronas have one or more successively fainter and gently coloured soft rings surrounding the aureole. The first ring is bluish on the inside grading through greens and yellows to red outermost. The colours are subtle mixtures rather than the more direct hues of the rainbow. The corona can be 15º or so in diameter and often it shrinks and swells as different clouds scud across the moon. The coronae is much smaller than the 22° halo which can also ring the sun and moon. The corona also has nothing to do with the Sun's outer atmosphere visible during a total eclipse and confusingly given the same name.